Less than a week into Black History Month, in two episodes of retail déjà vu, Adidas and Gucci have apologized and pulled products criticized as racist. The offending Gucci item was an $890 black-knit women’s balaclava that could be pulled up over the lower half of the wearer’s face. The sweater included bright red lips ringing an opening for the mouth, a detail widely denounced on social media as evoking blackface imagery. The sweater was part of a line of balaclava-style ski masks and knits in various color combinations included in Gucci’s fall-winter 2018 collection. Criticism of the designs spread quickly on Twitter, prompting the companies to act amid separate firestorms over the fashion industry’s pattern of racially offensive choices. 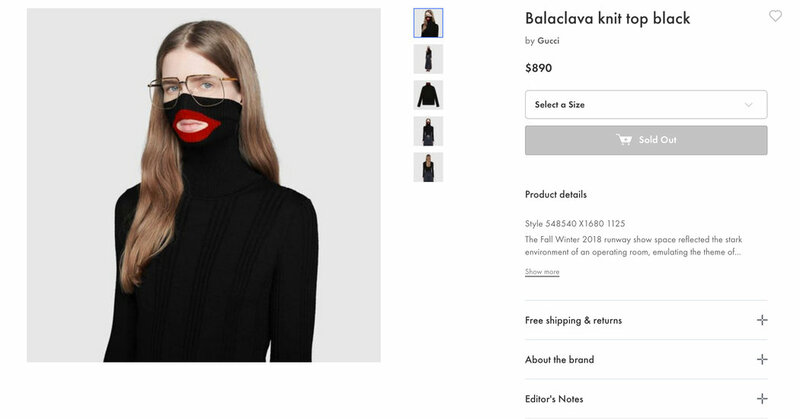 Gucci released a statement on Twitter late Wednesday, saying it “deeply apologizes for the offense caused” by the balaclava’s design. The company said it had removed an image of the sweater from its e-commerce site and was withdrawing the item from all of its physical stores. Several clothing makers have come under fire in recent years for similar missteps. Dolce & Gabbana was excoriated for advertisements laden with stereotypes about Chinese people. Zara has featured a skirt with a character like Pepe the Frog, a figure embraced by far-right groups. Prada adorned bags with charms, part of a line of goods called Pradamalia, that resembled black monkeys with outsize red lips. And the Swedish company H&M dressed a young black male model in a hoodie with the phrase “coolest monkey in the jungle,” setting off protests at South African stores. The fresh accusations of racism in the fashion industry coincided with a continuing political furor in the United States over the wearing of blackface and other racist behavior by prominent Virginia politicians in their younger days. Some people on Twitter responded to Gucci’s apology by urging the company to employ more black people to avoid similar episodes in the future. Others questioned Gucci’s motivations, suggesting that the sweater and the ensuing mea culpa were part of a publicity stunt. Still others saw the offensive sweater as a result of a centralized European company being unaware of aspects of American cultural heritage. The company, which is owned by the French luxury group Kering, was voted “the hottest brand on the planet” in the Lyst Index released this week. The list, compiled by a leading fashion search platform, found that from October to December 2018, more than six million shoppers searched online for a Gucci bag, belt or shoe.